In its renewed effort to up the ante in anti-smuggling activities and to maintain its role as a flagship command, the Federal Operations Unit (FOU), Zone A Ikeja has embarked on aggressive patrol activities along the borders and seaports. This was intended to compliment the efforts of the other customs commands in terms of ensuring maximal revenue generation. This was made known by the Controller, Federal Operations Unit, Zone A Ikeja, Comptroller Isa Nuhu in a release on its activities in the last one year and the Unit’s activities so far in the current year which was obtained by Primetime Reporters. Nuhu stated that it was pertinent to note that the presence of FOU operatives along some major flanks had transcended into monumental revenue gain for the customs commands in the zone. While giving the Unit’s score card in the yer 2013, Nuhu disclosed that the Unit made a total seizure of 3,553 (three thousand, five hundred and fifty-three) seizures of assorted prohibited goods valued at 1, 294,211,018 (one billion, two hundred and ninety-four million, two hundred and eleven thousand, eighteen Naira) with a payable duty of 227,073,983 (two hundred and twenty-seven million, seventy-three thousand, nine hundred and eighty-three Naira) with a Duty Paid Value (DPV) of 1,521,285,001 (one billion, five hundred an twenty-one million, two hundred and eighty five thousand, one Naira) between January to December, 2013. The figure according to him, represented a significant improvement from the report of the previous year, 2012 saying that comparatively speaking, the figure accounted for over 50 percent in terms of the Duty Paid Value and other variables. He noted that following the ban on rice importation through the land borders, the command beamed its searchlight on some volatile areas, particularly along the waterways which had been identified as flashpoints with a view to blocking all loopholes in the supply chains. According to him,” recall that the federal government of Nigeria in its wisdom placed this ban on foreign frozen poultry as a proactive measure to protect the investments of our local farmers who have invested heavily on poultry farming and other agro-allied industries”. “Also, the issue of job creation for our teeming youths made it more imperative for the service to enforce this ban. Beyond this, also is the need to safeguard the health of the nation in view of the understanding that those imported foreign frozen poultry products contain chemical substances that are injurious and detrimental to health”, Nuhu said. He observed that in the year under review, the Unit apprehended a total of 217 (two hundred and seventeen) suspects in connection with the seizures and that a good number of them were being investigated by the legal unit while others had been prosecuted in line with the legal requirements. 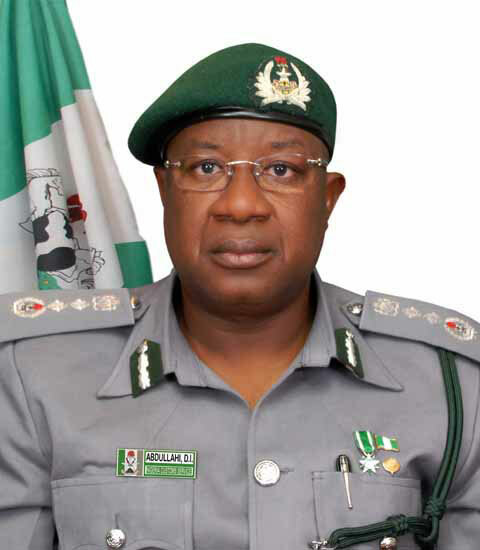 The customs boss also hinted that the unit had its own share of the operational challenges especially the death of some officers and men during the period under review amongst other challenges. The Unit notwithstanding, according to the Controller, had been able to rise stronger in the midst of these challenges adding that the unit was conscious of the fact that nothing good come easy and that had helped to strengthen their resolve not to despair in their determination to excel. Speaking on the activities of the Unit so far in the current yer, he informed that the Unit re-strategized its operational modalities to enure remarkable result for 2014 in order to justify the confidence which the customs management reposed on them. He added that the Unit had put all necessary measures in place for effective synergy with the critical stakeholders including the host communities where they operate and other relevant security agencies for the actualization of their operational goals and objectives. “We have in fact started reaping the results already with the spectacular seizure of 3,997 (three thousand, nine hundred and ninety-seven) cartons of suspected fake pharmaceutical drugs with 6 (six) drums of fake multivitamins valued at 5,850,000 (five million, eight hundred and fifty thousand Naira only) with a duty of 1,170,000 (one million, one hundred and seventy thousand Naira only)at the beginning of the year 2014. The controller therefore warned all hose who engaged in the unpatriotic act of smuggling to desist forthwith as the Unit was more propelled to deal ruthlessly with those he called the enemies of the country.